Kristine Henry with some of her creations. I was strolling through the trade show at the Kamloops Cowboy Festival when my friend clutched my arm. “You have to see this!” she exclaimed, towing me off towards a display. “Look at that!” She twirled a lazy susan. I looked in amazement. There were beautiful bowls, baskets, picture frames, framed clocks, mirrors, and lamps. All made of rope. 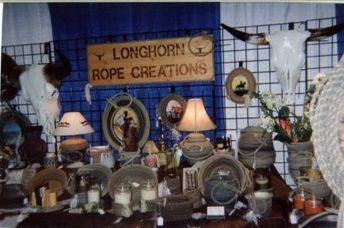 Seeing the quality and variety of her work, it’s hard to believe that Kristine Henry has only been making her Longhorn Rope Creations for five years. Of course she’s actually been working with ropes for much longer. She’s a team roper herself. From 1990 to 2005 she and her husband Doug had a big indoor arena in Vernon, B.C., where they taught team roping and put on team roping events from October to March every year. There always seemed to be a lot of rope lying around. “When team ropers were’t happy with their ropes, they just threw them away. “ Kristine remembers. She thought a lot about those rejected ropes. She was fascinated. She got some e-mail instructions from a lady in Arizona; all the rest has been trial and error and experimentation. Rope art is more widely done in Arizona, but the artists don’t seem to stick with it. Kristine’s theory is that they run out of rope. She’s on the trail of used ropes. Fellow team ropers who winter in Arizona promised to bring her back used ropes. Imagine explaining that at the border. She has a friend in Celista B.C. who uses a lot of rope. If she’s doing a big project, like a tall lamp or a clock, she’ll wait for him to go through about six ropes. A big lamp takes three ropes. A water fountain took six . Doug, her husband, is very helpful and supportive. Mind you, for her first project, Kristine wanted to be sure she didn’t waste a good rope. She dug around and chose one lying on the bottom of a pile. “That was my best poly rope!” moaned Doug when he realized what had happened. 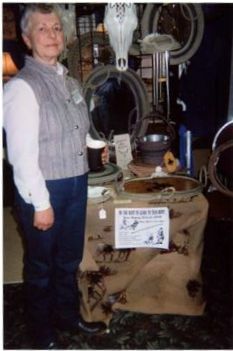 Kristine's display at the 2009 Kamloops Cowboy Festival. There’s more to her pieces than the ropes; she has to rewire the lamps and find shades to match a western motif. Fountains have to be set up correctly. Kristine has done some custom work. When someone who was a team roper has died, friends have commissioned picture frames made from his favourite rope. Kristine also decorates and sells longhorn skulls.